A corridor partnership plan is developed locally and is intended to be a tool for local governments and citizens along the byway. Its purpose is to identify the key features along the byway and methods to enhance and promote those features over time. A corridor partnership plan is also required for state scenic byways seeking implementation grants or designation as a National Scenic Byway or All-American Road. The Corridor Partnership Plan is not intended to be a detailed plan for each parcel of land along the route. Instead it clarifies how local citizens will assume responsibility for the long-term management and promotion of the byway's key features. No one is better positioned to make informed choices about the byway than the local residents. What are the benefits of creating a Corridor Partnership Plan? 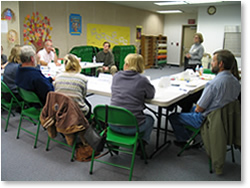 Byway planning meeting in Unalaska, 2004. 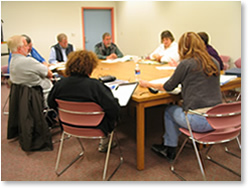 Visioning Session for the Glenn Highway National Scenic Byway, 2004. What are the components of a Corridor Partnership Plan? A map identifying the corridor boundaries and the location of intrinsic qualities and different land uses within the corridor. An assessment of the intrinsic qualities and of their context. A strategy for maintaining and enhancing those intrinsic qualities. A schedule and a listing of all agency, group and individual responsibilities in the implementation of the corridor partnership plan. A strategy describing how existing development might be enhanced and new development might be accommodated while still preserving the intrinsic qualities of the corridor. A plan to assure on-going public participation in the implementation of corridor management objectives. A general review of the road’s or highway’s safety and accident record to identify any correctable faults in highway design, maintenance or operation. A plan to accommodate commerce while maintaining a safe and efficient level of highway service, including convenient user facilities. A demonstration that intrusions on the visitor experience have been minimized to the extent feasible, and a plan for making improvements to enhance that experience. A demonstration of compliance with all existing local, State and Federal laws on the control of outdoor advertising. A signage plan that demonstrates how the State will insure and make the number and placement of signs more supportive of the visitor experience. A narrative describing how the National Scenic Byway will be positioned for marketing. A discussion of design standards relating to any proposed modification of the roadway. This discussion should include an evaluation of how the proposed changes may affect the intrinsic qualities of the byway corridor. A description of plans to interpret the significant resources of the scenic byway. a) A narrative on how the All-American Road would be promoted, interpreted and marketed in order to attract travelers, especially those from other countries. The agencies responsible for these activities should be identified. b) A plan to encourage the accommodation of increased tourism, if this is projected. Some demonstration that the roadway, lodging and dining facilities, roadside rest areas, and other tourist necessities will be adequate for the number of visitors induced by the byway’s designation as an All-American Road. c) A plan for addressing multilingual information needs. Further, there must be a demonstration of the extent to which enforcement mechanisms are being implemented in accordance with the corridor partnership plan.